Someone sent me this funny email and thought I'd play along except that I'd do it as a blog-post (to keep it going) instead of as an email. I've continued where it left off. You can play too. Just continue where I left off (the last entry) - leave your input as a comment and I'll link you on this post. Bear in mind though that your input must make sense to the context of the story. Let's make it a rule to indicate the country of where the blogger is from, eg., (Made in Japan) if you are from Japan, etc. This is fun! Come on.. join in! Get linked..
John Smith started the day early having set his alarm clock (MADE IN JAPAN) for 6am. calculator (MADE IN MEXICO) to see how much he could spend today. After setting his watch (MADE IN TAIWAN) to the radio (MADE IN INDIA) he got in his car (MADE IN GERMANY) filled it with GAS (from Saudi Arabia) and continued his search for a good paying AMERICAN JOB. Thinking it was his imported wine delivery that was late. he slapped himself on the forehead in self-chastisement. rang. He got up to see who was at his front door. Looking from behind the window curtains, he couldn't see anyone at first. And then he gasped! For centuries, there have been predictions of the end of the world, from the Mayan calendar to the Chinese I-Ching, to the Bible and others. 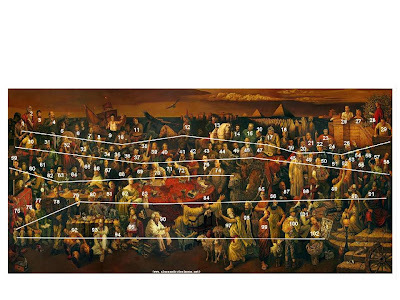 Oracles down the ages have come up with accurate predictions of the birth of Christ, the anti-Christ, World Wars I and II, Napoleon losing the battle at Waterloo, even global-warming, 911 and many other catastrophic events. And now as time draws near, we are reminded of the impending end of the world. The Mayan calendar which has accurately predicted eclipses suddenly stops at one particular date which experts conclude that that could be the day the world will end. This date is Winter Solstice, December 21 in the year 2012 - which is only less than four years away. Actually, about ten days shy of three and three-quarter years away, to be exact. Will the world come to an end or will there be an upheaval that changes the Earth's axis displacing countries altering seasons? In fact, altering everything as we know it today resulting in a totally new world? Someone once told me that the human race will not be wiped out. Why? Because each and everyone of us has to pay for our bad karma on this Earth. But I digress..
Do you think all this hype is just a joke? Perhaps to get the human race to repent and do something positive to save this blue planet we call home? Your guess is as good as mine. The following videos are interesting. Take a look. You may want to skip the fifth video because it could be a repeat of the one before it. I didn't want to remove it so as not to upset the numbering but feel free to watch it too, if you like. According to the original source, this could be a repeat of the video above. You may want to check it out. Do you think animals have feelings? Received an email of a moving tale of a swallow who lost his mate to death. It was reported that millions cried after watching these pictures. Here the swallow’s wife is injured and the condition is fatal. She was hit by a car as she swooped low across the road. He brought her food again but was shocked to find her dead. He tried to move her….a rarely - seen effort for swallows! Millions of people cried after watching these pictures. It is said that the photographer sold these pictures for a nominal fee to the most famous newspaper in France . All copies of that newspaper were sold out on the day these pictures were published. Do you still think animals don’t have brains or feelings? Despite the economic slowdown, there was a good crowd of bargain hunters at the annual property showcase, Penang International Property Expo 2009 (PIP09), held at the Penang International Sports Arena (PISA) in Relau, Penang. Many were seen busy collecting brochures and enquiring about property projects and their attractive incentives, easy financing packages and free gifts. There are 55 exhibitors showcasing their properties, products and services at this 3-day event. House-buyers have a wide choice of various properties, some with an attractive loan package. I wonder if Wilmington NC real estate comes with such an enticing package too. Me, outrageous?! LOL! Well, maybe just a wee bit..
Like most daring people, you are highly intelligent and creative. That's why you get bored so easily. You need a lot of stimulation and novelty in your life. You aren't satisfied with the mundane. MSN reported that In Tokyo, a FedEx cargo plane burst into flames after bouncing off a runway in unusually high winds at Tokyo's main international airport Monday, killing the pilot and copilot and closing a major runway for several hours. The flight from Guangzhou, China, skipped along the main runway at Narita Airport before skidding to a fiery halt, according to footage from airport security cameras. Firefighters and rescuers immediately swarmed the plane. The only people onboard the flight, the pilot and copilot, were pulled from the cockpit and taken to a local hospital, where they were later confirmed dead. Elsewhere in Montana, USA, there was another air disaster involving a small plane, possibly carrying children on a ski trip. The plane crashed Sunday as it approached the Butte airport, killing 14 to 17 people aboard. The single engine turboprop nose-dived into a cemetery 500 feet from its destination. The aircraft crashed and burned while attempting to land. We are drawing near, the Earth Hour, I mean. What is Earth Hour? There you have it. You know what to do during Earth Hour.. to switch off non-essential lights and electrical appliances for one hour. Earth Hour 2009 aims to reach more than one billion people in 1000 cities around the world. Be a part of that number. Malaysia is participating this year. Screen and stage have lost a remarkable actor (actress). A sudden twist of fate has resulted in the sudden goodbye of actress Natasha Richardson. She was the wife of Liam Neeson, daughter of Vanessa Redgrave. Most of you may know her as the mother to the twin girls in Parents Trap in which Lindsay Lohan played the double role as the twins. Richardson died on Wednesday in a New York hospital after a ski accident on Monday in Mont Tremblant, a ski resort in Quebec, Canada. She was 45. Richardson suffered a head injury while taking a beginner's ski course. It was reported that the first ambulance sent to the ski resort where Richardson suffered the fall was turned away. It was also reported that she did not show any visible sign of injury but the ski patrol followed strict procedures and brought her back to the bottom of the slope and insisted she should see a doctor. She was eventually moved to a Montreal hospital before being transferred to New York. It was a two-and-a-half-hour trip. According to a doctor, lack of medical helicopter cost the actress. Alright, it is the weekend again and in case you are out of activities to indulge in, here is something that might interest you. 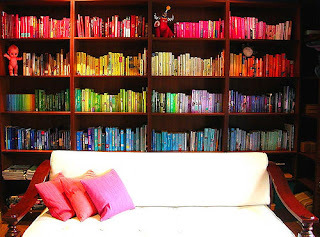 You can arrange all your Books by color like this.. Most of my friends hang everything together. So when it comes to looking for an item, sometimes they would have to dig through racks and racks of clothes. How do you arrange your clothes? Maybe you have a better system.. ? 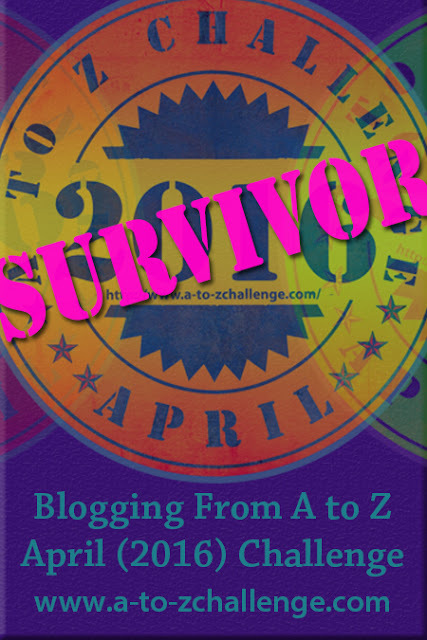 Friday Frolics - What's Your Word? If there is one word that best describes you. What do you think that word would be? Do this quiz and find out. Interesting questionnaire too, so check it out. What I got is kinda surprising because of all the words in the world, it has to be this one. I wonder how wide is the vocabulary here. Help me find out. Would you please? In my office, PCs and laptops get upgraded often so that we are abreast of the times. I think people or especially those entrusted with decisions should also get a memory upgrade now and then too. Case in point is the name-change in road names and areas. After the fiasco of changing Jalan Alor, here we have another similar incident of an unwarranted name-change. The Star today reported that a controversial move to change the name of Klang’s famous Little India to Medan Kelana has sparked a public outcry. Little India is a famous shopping enclave with 100 pre-war shops on either side of Jalan Tengku Kelana. It draws shoppers by the thousands and is an important income generator for Klang. Like the case of Jalan Alor, even tourists are chipping in saying it would be a shame to change the name of a place so easily recalled by tourists. N.B. A little about Klang from Wikipedia: Klang is the royal capital of the state of Selangor, Malaysia. 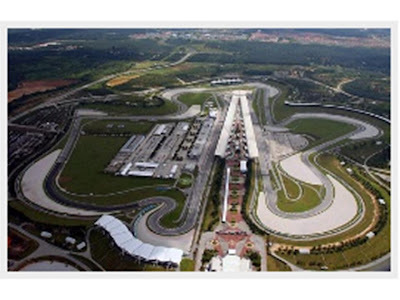 It is located within the Klang District in Klang Valley. 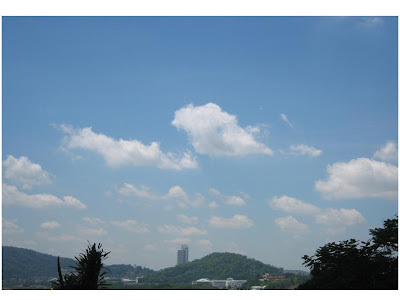 It is located about 32 km to the west of Kuala Lumpur and 6 km east of Port Klang. It was the civil capital of Selangor in an earlier era prior to the emergence of Kuala Lumpur and the current capital, Shah Alam. Port Klang, which is located in the Klang District, is the 13th busiest transshipment port and the 16th busiest container port in the world. Friday Frolics - How Pure Are You? This can't be right! LOL! You're the type of person people feel bad cursing around. And while you may be inexperienced, you're not easy to corrupt. As Kuala Lumpur revs up with preparations for the Formula One races from April 3 to 5, department stores in Malaysia are singing a similar hot tune. The Grand Malaysia Sale is back and promises to be as attractive as the Mega Sale (in July) if not more. Until April 5, major department stores are offering up to 70% discounts. Coming from the south of the border, Tangs is really big in Singapore and has received a similar welcome on our shores. Their “Sale or Nothing” is bound to set hearts aflutter and wallets a-flapping with great discounts at its store in the Pavilion. Somerset Bay, Living Quarters and East India Company are some of the house brands that Metrojaya offers. It’s latest outlet is at The Curve in Mutiara Damansara. Coming onto our shores the second time around, Debenhams is now housed at The Curve and is set to bring in the best of England’s fashion and products. It retails Red Herring and Maine New England, which are Debenhams’ popular housebrands and this is a good season to get items on your wish list at great discounts. This department store operates only in the capital city and offers many quality items for less during the sale. Its stores are at Suria KLCC, Jalan Ampang; Lot 10, Bukit Bintang; and at The Gardens, Mid Valley City, off Jalan Syed Putra. During this grand sale, there will be pockets of promotions targetting several departments within the store, namely the Home Fair on March 12-22; and The Leather Mania sale, which ends on March 15. Their stores are located at all major cities and towns nationwide. Having just celebrated their 15th Anniversary, Sogo is the favourite department store for middle class families with their good sales and strategic location on Jalan Tuanku Abdul Rahman, right in the heart of the capital city. The Store is appealing to many, especially those in rural areas as their outlets are more readily found outside big cities and towns. Always giving their customers the best deals, The Store never fails to deliver during sales such as these with their drop-dead pricing. This is another hot Malaysian favourite that is celebrating its silver anniversary this year with lots of sales and good buys, which began on Jan 27 and has continued to usher the GP nationwide sale. For homemakers, this is one of the best department stores to buy your kitchen utensils at great discounts now! For many in the Generation Y and before, Marks & Spencers is a name they know and value and have been on our shores, at One Utama, Sunway Pyramid. Suria KLCC and The Gardens, for sometime. Check out their good deals and stock up on the good, old English biscuits that are available at their specialty stores. Bringing a new concept in fashion is what Robinsons has offered Malaysians since its debut at The Gardens, Mid Valley City, off Jalan Syed Putra in Kuala Lumpur. Among their star brands are Casualist, Blend and Martinique for men; Coast, Trucco, Fenn Wright Mason, In Wear, and Episode for women. 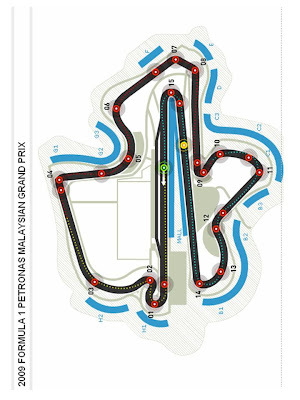 By the way, this is how the race track in Malaysia (Sepang) look like. Interested to see the races? You can purchase tickets, hotel or book a package online. 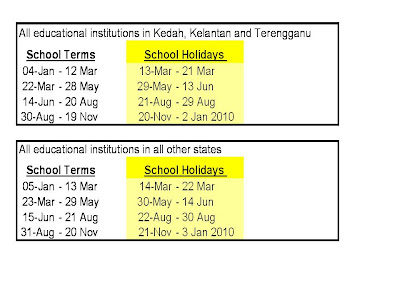 Last year, when I put up a post on 2008 public holidays, I also included the Public Holiday schedule for 2009. Thought I would put one up separately for 2009 public holidays. The upcoming school holiday on Mar 13 prompted me to also include the school terms and school holidays schedule for those of you who have school-going children or nieces and/or nephews. This listing issued by the Federation of Malaysian Manufacturers (FMM) is as announced by the Ministry of Education and published in the Government gazette. Hint! Have you made your holiday plan yet? The AirAsia cheap travel booking is still on (until Mar 15). The Party Must Go On.. It is a glorious day outside, white fluffy clouds floating by against the blue blue sky. Nope, did not spot any UFO like the last time. After the days of rain and gloom the past week, blue skies are very much a welcome sight. Today is March 8. Does it ring a bell? This time last year, most Malaysians had to wake up early (yours truly included) in order to beat the queue at the much anticipated General Elections. Many were hoping for a change in government, little did we know that the upheaval was in fact so close at hand. The results turned out positively overwhelming for some and overwhelmingly devastating for others. Opposition won a number of states to the horror of the ruling party. The rest is as we know it today. This time last year was more joyful, in terms of the economic situation. This time around, like elsewhere in the world, Malaysia is suffering probably the worst economic crisis Malaysia has ever seen with close to 20,000 people losing their jobs. There is bad news all around, including the country's political scene where both the left and right wings are bickering non-stop not being able to reach closure enough to move on. This is really sad as their resources should really be put to much better use, such as thinking up and working on strategies to improve the nations's economic situation to lighten the burden of the people, helping them put food on the table. No, I won't go any further. Sure don't want to add to the gloom. 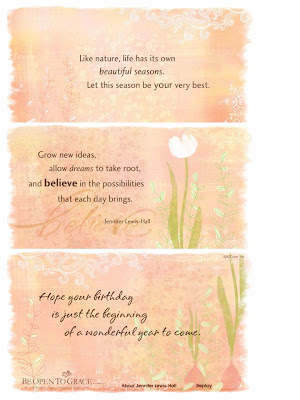 I hope you will have a wonderful day ahead. Happy birthday, LB. Happy birthday, Samy Vellu. Wonderful! The weekend is here again. I hope the weather holds up as these past few days, the weather has been upsettingly unpredictable. The morning can start off with a cool (Malaysian standard) 75degF rising to at times 91 degrees and all of a sudden sheets of rain come tumbling down and with such gusto that it is madness to even contemplate going downtown for fear of being caught in a horrendous jam and flood waters rising at the same time. I know, this is a bit dramatic but believe me, it's real. I hope this does not happen today as I need to go downtown this evening to attend a cousin's wedding dinner. I hope you will have an enjoyable weekend, all in the pink of health. And talking about pink, here's something you must see, something positively pink and cute. 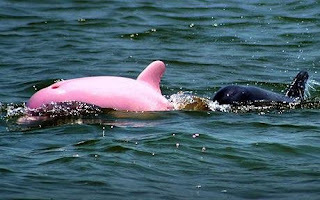 It's a pink dolphin spotted in an inland lake in Louisiana, USA. It is an albino dolphin and it has got red eyes. The beauty of nature. 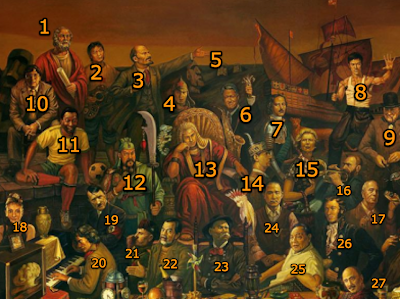 For Friday Frolics this week, let us get back to history a bit, a game of identifying famous figures. Look at the two images below and see how many of these famous personalities can you name, off-hand, of course, without googling for the answer. Ready..go.. The above two images are actually sections of the full picture below. 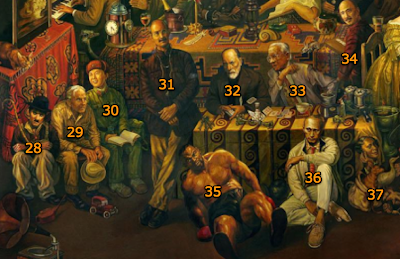 Challenge yourself, how many more can you name? Click on image to enlarge. Okayyy, let's start the day with a good aerobics workout with this number by Madonna, Give It 2 Me. I heard this song again the other day on Ellen DeGeneres show and thought I'd share it with you here. Sorry about the video quality. It is the best one I could find. So, if you are up for it, let's do it! Lyrics follow the video so you can sing along. Above (picture courtesy of The Star) is a scenario of cars (parked behind the Putra World Trade Center) being submerged in muddy waters after a thunderstorm in Kuala Lumpur yesterday. 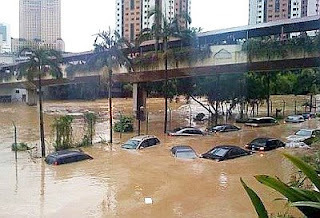 Thousands of motorists were stuck in massive traffic jams for more than two hours in various parts of the city as flash floods hit Kuala Lumpur. If one were to be at the junction of Dynasty Hotel on Jalan Ipoh and in the Kampung Baru area, one would have experienced flood waters risng up to 2m. Some motorists had to abandon their cars in the middle of the road when the flood waters threatened to submerge their vehicles. Badly-hit areas included Jalan Kolam Air, Jalan Union, Jalan Parlimen, Jalan Gombak, Bulatan Dato Onn, Segambut and Jalan Tun Razak. Flood waters began to recede after the Smart Tunnel was closed to traffic to enable flood operations. And elsewhere in the city, several LRT stations were jam-packed last night when thousands of commuters were stuck for more than an hour due to the RapidKL Kelana Jaya LRT service being halted by a power failure during a storm. Some commuters were stuck in trains and only reached their destinations hours later. Power was restored gradually from 7.15pm and train service resumed in stages with service returning to normal at 7.47pm. RapidKL will investigate the cause of the incident. Hope you were not caught in any one of these. It is pouring again as I am writing this. Let's hope there will not be a repeat performance of yesterday's gloom. What can RM1 (One Ringgit) buy you these days. Not much. Not even a decent packet of nasi lemak. But hey, it can still buy you a ticket from Kuala Lumpur to Langkawi or Singapore. On budget airline, Air Asia. And with a return flight, the whole trip will only set you back by RM142. This would be like one-fifth of a MAS trip to the same destination. Yep, that's travelling budget for you, that is if you don't mind having to walk on the tarmac to the aircraft, paying for your seat, your refreshments, but not the use of the lavatory yet. Who knows, this might happen as Ryanair (Irish low cost airline) hinted that passengers might be obliged to insert a British pound coin for access to the lavatory to get some in-flight relief. But I digress. 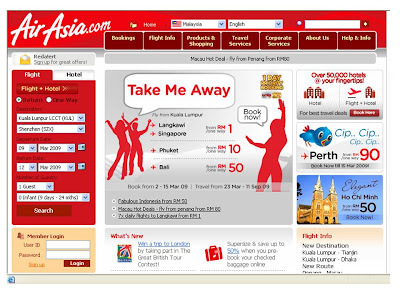 Back to Air Asia's cheap fares. One way ticket to Phuket is only at RM10 while to Bali it is RM50. Time to give yourself a holiday then. There is a catch though, travel period is only between Mar 23 to Sep 11. Still, it is a good six months to go. So, start making plans for your holiday now. 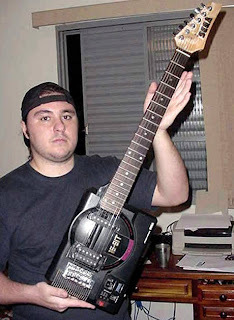 Guitarists Have So Much More Fun! A visiting colleague from the US asked me something that I never knew exists in Malaysia. Showing me an address on his notebook, he asked for directions to a luthier he met several months ago. 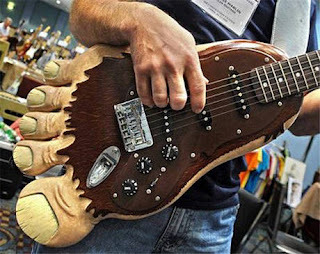 I know..what is a luthier? According to the online Dictionary that I use, a luthier is a craftsman who makes stringed instruments (as lutes or guitars or violins). 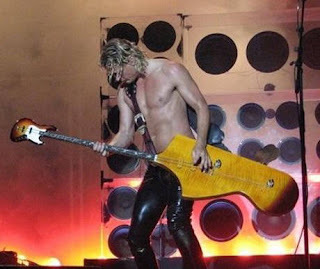 The luthier in question here makes guitars or rather he owns an outfit that makes guitars. How cool is that?! I truly never knew such a craft exists in Kuala Lumpur. Managed to hook them up and the colleague made a visit. I never did find out any further nor took note of the contact details. Sorry. 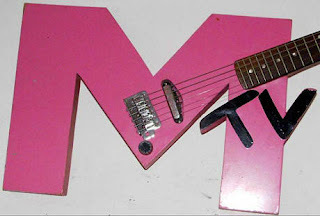 And back to guitars, here are some guitars that are, according to the site, coolest, ugliest, most badass, silliest, sickest and most epic failing-est guitars in the world. Of course, it's all subjective. Beauty lies in the eye of the beholder. 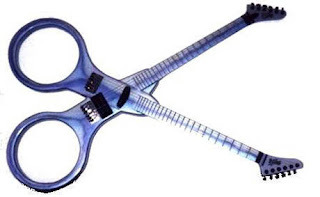 ..and more guitars here.. and if you are in music-making, this is one site you may want to explore. Yes, you, MM. When I was in lower primary, (down memory lane a little here), my favorite period used to be Arts & Crafts. We would alternate between actual art activity (water-color painting) and crafts activity (making crafts - puppets and stuff). One of the latter is playing with plasticine and building blocks and bricks, and we would always wish the period was longer than its 40 or 45 minutes. When we think building blocks, what comes to mind? Why, LEGO, of course! Children can spend hours on the simple activity of assembling and breaking up LEGO bricks. That accounts for why parents have a tough time tearing kids away from Lego brick stations at malls. Playing with these bricks is actually educational. Among others, it improves a child's dexterity and inculcates imagination and creativity. LEGO is not only for kids. Oh, yeah! Adults too can get equally fascinated by and get caught up with these small, versatile and colorful bricks and miniature figurines, etc. 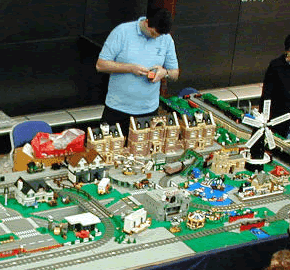 This picture is from The Brickish Association, a UK-based community of Adult Fans of LEGO (AFOLs). 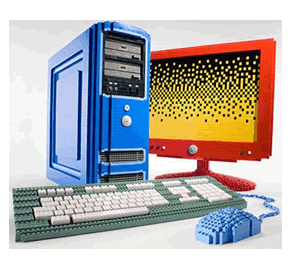 Theirs is a very active community both on and off the Internet and their members are interested in all aspects of LEGO, from its history and collecting to building and displaying. 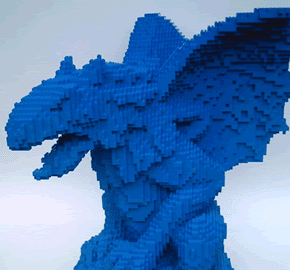 A few other inspiring and creative works of LEGO art.. 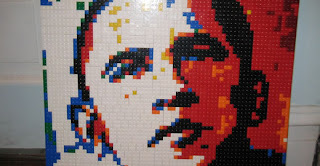 Check out more and the source of these LEGO creations.. So when was the last time you played with LEGO bricks? Been a while, eh? It is hard to believe that Kuala Lumpur can run out of hotel rooms sometimes. What I mean is rooms at 5-star hotels. A friend who is organizing a conference early April is finding it difficult securing hotel rooms for delegates. Yes, Kuala Lumpur does play host to international meetings and functions. Early April happens to be Formula One and when this event comes to town, not only are rooms limited, the ones available are priced three times the regular rate! My friend sometimes had to put guests at extended stay hotels or apartment hotels. If one is staying for an extended period of time, I should think extended stay hotels are most suitable as they come with a kitchen, just like what a home has, plus the place comes with full hotel amenities. And it is a lot cheaper too. Quick, make a guess. What do you think this object is. If you guessed 'fish', then you are absolutely correct. This is a newly-discovered frogfish found in the shallow waters off Ambon island in eastern Indonesia. Named "psychedelica", this fish bounces on the ocean floor like a rubber ball and has been classified as a new species. It has a swirl of tan and peach zebra stripes that extend from its aqua eyes to its tail. It also has a flat face with eyes directed forward, like humans, and a huge, yawning mouth. 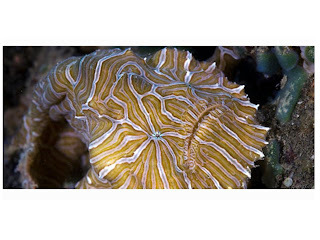 Its fist-sized gelatinous body covered with thick folds of skin protects it from sharp-edged corals. It is heartening that new animal species are still being discovered though I hate to think that we are seeing new species because their habitats have been disturbed or polluted (by us). Tell me, what is the most memorable or unusual sea-creature you have ever seen.